Infrastructure is the core part of any company and thus a major share is invested in its development. We are well supported a hi-tech infrastructural facility in which all the latest technologies are installed. We have fully fledged infrastructural facilities spread across an area of 11250 square feet sq ft. across the industry, we have made of mark of success by including all types of wooden pallet manufacturing facilities in our infrastructure. All these advanced facilities are well maintained for an excellent production, not only in terms of quality but also in quantity. We have also established our own heat treatment facility in which post production, all the wooden pallets, boxes and crates are chemically treated for protection against termites, wood bores and insects that can hamper the quality in future. We boast our advanced production facility in which there is established an extensive range of machines and tools. In our production facility, we have both open and shed area. All the machines are up-graded time to time so that bulk orders of clients can be completed within stipulated time period. It’s our dedicated efforts in up grading the machines that today; we have a total production capacity of 1000 pallets per day. In addition to this, our production facility is advanced enough to customize the pallets, crates and boxes in accordance with customers’ specific requirements. Moreover, we have appointed a dedicated team that comprises of separate specialized experts to produce pallets, boxes, crates and bins. Post production, we have an excellent facility of quality check system through which quality of the product is inspected at two levels, first before assembly and final check before loading. We have established our own in- house FHAT (Heat treatment) facility with excellent capacity of 300 pallets per batch. Our all the products are heat treated for complete protection from termites and other wood bore insects. 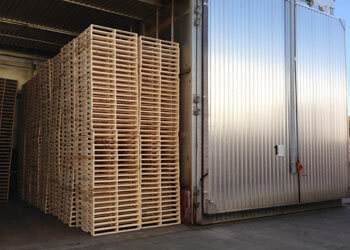 This ensures long time durability of our wooden pallets, crates and boxes. We have also achieved ISPM 15 or International Plant Protection Convention Measure 15 heat treatment certification for our entire product line. This certification makes our products suitable for transporting goods across country. In our heat treatment unit, a separate fire wood & diesel fire chamber is installed to heat treat solid wood that will be further used in the construction of pallets. The chamber is integrated with an automated data reading system that continuously monitors room temperature & moisture for accuracy with consistency. We have appointed a dedicated team for our specialized segment of Project Packaging. For this, we have employed a separate team of experts who are well versed in safe and speedy movement of different type of export as well as domestic consignments. The team is provided with complete training for container filling, container stuffing and choking. Prior to any transit, we make sure to verify all technical aspects at different levels to avoid damage and breakage to goods. We are readily engaged in delivering seaworthy packing in stages to respectable clients. This is accomplished utilizing best quality raw material and sophisticated technology that are in compliance with the industry laid norms and standards.